Can I Adopt If I’m in the Military? Did you know that many of those in our military choose to find their forever families through adoption? 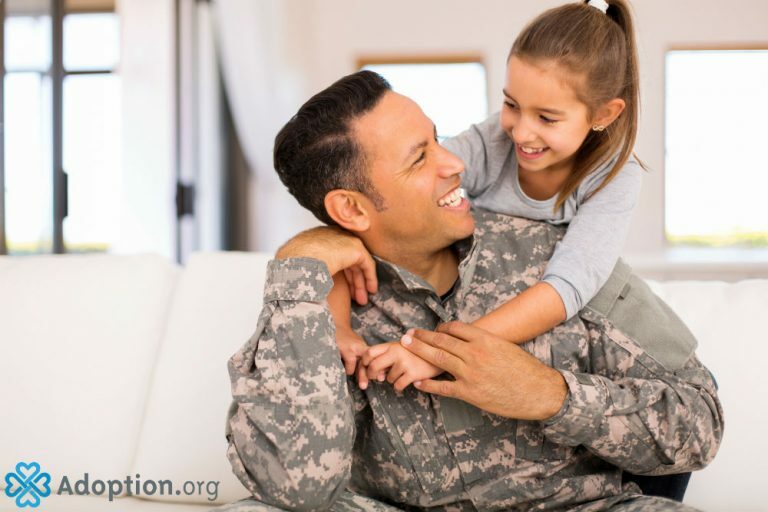 There is an entire help network set up through the Military One Source program that will help you decide if adopting privately or through foster care is right for you. The military even has an adoption reimbursement program that allows soldiers to receive up to $2000 for adoption expenses, and the military also provides the same maternity leave for soldiers adopting (up to 21 days) as it does to those who give birth. In addition, your new child’s health care benefits can start almost immediately, and you don’t have to wait until legal finalization to make sure your adopted child has insurance. If you are a soldier and are looking into adopting through the foster system, all of the above entitlements are also available to you. You may have to jump through a few extra hoops, such as getting official clearance to make changes to your housing if you live on post, or clearing extra leave time for licensing classes, but many servicemen and servicewomen provide both temporary and permanent homes for foster children. Have the regulations in hand. When you go into DEERS or to speak to your commander about leave, have the regulations that apply to your branch of service to back you up. We know you deserve it, but there is always that one individual that may not be aware of your entitlements. Take the leave you have earned. You owe it to your family to take that time off, even if there is a big meeting, exercise, or duty coming up. The military won’t be by your side in your old age—but your family will, so make sure your priorities are in the right place. Get multiple copies of all finalization papers, birth certificates, and official forms. You probably won’t be living in the same state that you adopted from by the time you need a copy of something, and it can be a massive pain to try and track things down through snail mail. Don’t forget your reimbursements! You have a calendar year to apply for the Military Adoption Reimbursement, through form DD-2675. Don’t put it off! If your child has any special needs, either physically, medically, or developmentally, don’t put off registering them through the proper channels in your branch. Get his or her needs taken care of and make sure you will always be sent to a duty station that can accommodate your family. Military One can help you with all of the steps.